Khanh NguyenKhanh Nguyen, a physics and mathematics double major at the University of Houston, is one of 283 students nationwide chosen for a 2014-2015 Barry Goldwater Scholarship. She will receive up to $7,500 to support her undergraduate education. The Goldwater Scholarship is one of the most prestigious scholarships for students in mathematics, natural sciences and engineering. Nguyen is the only UH student selected for the honor. By her second year at Dobie High School in Pasadena, lectures in English were much easier to understand. Nguyen, a junior in the College of Natural Sciences and Mathematics (NSM), is involved in undergraduate research and works with Zachary Kilpatrick, an assistant professor in the Department of Mathematics, on research in mathematical neuroscience applications. The project looks at navigational ability and the brain and uses mathematical modeling. She also participated in a 10-week summer research program with Dr. Lev Gelb at the University of Texas at Dallas in summer 2013. As part of NSM’s Scholar Enrichment Program, Nguyen taught the Physics II workshop in fall 2013, helping students better understand physics. 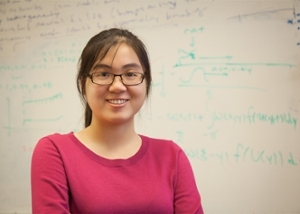 This semester, she is a specialized tutor in Physics I.
Nguyen will graduate in May 2015. She plans to pursue a Ph.D. in applied mathematics and to conduct research in neuron mathematics and teach at the university level. “It is such an honor to receive this scholarship. It will help me complete my last year at UH without having to worry about paying for tuition,” she said.